Well here’s the deal with this beer. on June 13th 2011, back when I was booking shows, I had helped book a show which featured a band from Pennsylvania named March to Victory. Their guitarist, Ismael Morales worked for Lancaster Brewing Company, and so in their van, they had some of their own beer they were touring with. Of course, I was talking Metal and Beer with these gentlemen, and they surprised me with a couple of cans of Lancaster Kölsch. What an awesome band for parting ways with these. 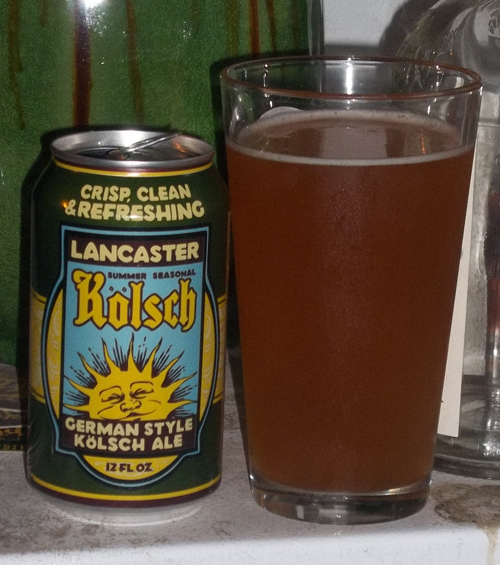 Since we do not get Lancaster beers down here, this was my first time drinking beer from this brewery. I had the first can they gave me a few days after that show, way before BeerMetalDude was born. Now I am not sure if what I did next was a good thing or not, but let me explain. Considering this beer has been in my garage for over a year and a half, it held it’s ground very well. I poured the beer from it’s 12oz can into my Deschutes Black Butte Porter pint glass. The beer looked great with it’s bright orange color with a finger width white head which stayed about half way down, leaving a nice lacing on the glass. The taste of this beer is just as good. There is a floral taste with citrus fruit combination going on here. Yes, I can definitely drink 1-6 of these while cooking outside. Damn you Lancaster Brewing for not being regularly distributed here in San Antonio, TX. I could go for another one of these right about…wait for it….wait for it….NOW!